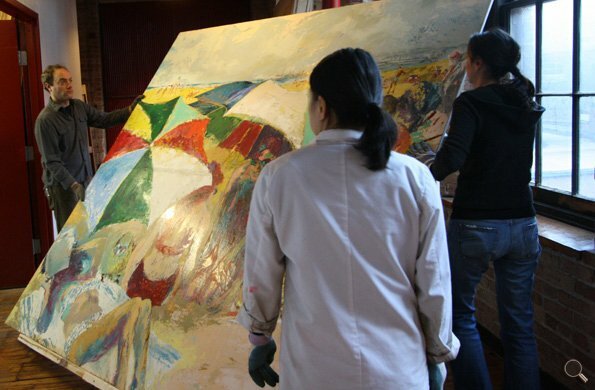 At 56 feet long, LeRoy Neiman’s Summertime Along the Indiana Dunes is the largest painting this celebrated artist ever created. 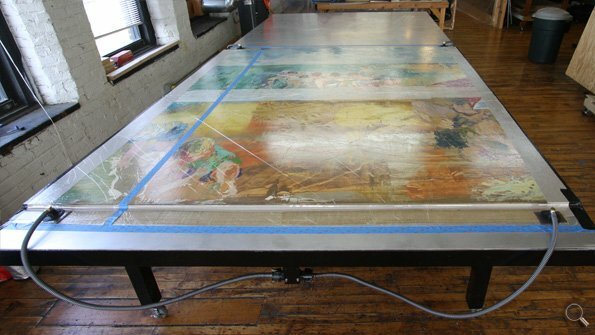 It was originally installed in the Mercantile National Bank in Hammond IN, but recently the artist donated this large mural on panel to be placed in the School of the Art Institute’s LeRoy Neiman Center. Parma took care of deinstallation, removed and replaced the heavy supports, then cleaned and installed the mural in its new home. Special “cradles” were built to help support the panels throughout the process. First: Panels are carefully moved throughout the studio on a custom built A-frame. Second: A wooden cradle was built in order to transport and flip the artwork for treatment. Third: Panels are attached to new, lightweight aluminum supports on the vacuum table.